Are you ready to get moving towards your first design? The Paying It Forward design school kicks off right here, with the essential but sometimes overwhelming step of figuring out what your creation is actually going to be. We’ll look at developing your concept, deciding what publishing route to take, and making your pitch. post will include a list of resources, our personal perspectives, and an assignment. The whole programme (seven topics) will run over three months, so if you work through it, you could have a published pattern by summer, or (since the last topics cover marketing and business questions) even sooner. We want to be clear that we are not professional coaches and this is not intended to be a professional coaching programme. We want to share our experience and opinions, and direct you to the many excellent resources available to help you get started in design (which include brilliant professional coaching!). There is a lot of help out there; we are here to help you find what you need. So let’s get started. The very first step is coming up with an idea. Most likely you already have one – or many! Finding ideas isn’t usually the hard part. What can be hard is committing to one idea, out of the many; and getting past your self-doubt. A lot of people have told us they have trouble figuring out whether their idea is “worth it”. What that often means is: is my idea original enough? Is there any point in adding another scarf pattern to Ravelry’s 50,000 scarf patterns? (That’s not hyperbole. It’s actually 50,270 at time of writing.) I (Robynn) strongly believe this is the wrong question. Originality is overrated – what matters is execution. And this is true in every creative field. There is very, very little truly new; if you worry about not copying anyone, you will block yourself from ever starting anything. If your idea is interesting enough to you that you want to make it, there’s no reason to think it won’t be interesting to other makers as well. The more you design, the more likely you are to create truly distinctive work, just as a natural expression of your developing style. But you can’t start there. Start with: do I like this? Crafters are attracted to designs that are beautiful, and beautifully presented, and to patterns that they expect to be well written (meaning: clearly explained, error-free and delivering the same results they see in your sample). We’ll talk more about each of those aspects in later posts, but for now, focus on the design itself, and remember that a lot of things go into making the pattern “worth it” – none of which involve a unique and brilliant concept. Besides the concept, figuring out how you want to publish is a key early-stage decision. Very broadly, your two options are self-publishing (with or without yarn support), or third-party publication (which could be through a magazine or book, a yarn company’s pattern collection, etc). Self-publishing offers the most flexibility and the most control, and the highest potential upside (if your pattern becomes a huge hit! ); but it is also the most demanding in that you are solely responsible for absolutely every aspect. And, especially for your first patterns, it may well cost you more than you earn. – You already have some self-published patterns but want to get your name in front of a new audience. On that last point, note that magazine exposure doesn’t always translate to people viewing your Ravelry page. You’ll need to consider the magazine’s editorial style (how prominently do they feature designers’ names?) and market. Online magazines such as Knitty may well deliver a bigger boost to your Ravelry views, even if the fee is lower. Andi Satterlund’s recent blog post (which covers a lot of the same ground as this series, and is well worth reading) also includes an example of a submission. Andi points out that fancy presentation isn’t as important as the content: tell the editors what they need to know and follow instructions. Interesting thread on physical submissions. – Your idea is likely to evolve as you go – don’t submit to a magazine unless you are sure you can deliver what you’ve pitched! It’s certainly possible to be accepted to a magazine without past experience. But editors will consider you a risk. You’ll have to try that much harder to convince them through your submission that you are professional and prepared. On the other hand, arguably, magazine publication is a better deal for newer designers, since your earnings from self-publishing are likely to rise over time. Still: for the purposes of this series, we’re focusing on self-publishing. Self-publishing designers often seek yarn support – or what non-designers sometimes think of as “free yarn”. IT IS NOT FREE YARN. Whoops, sorry for shouting there. But this is crucial. Yarn support is a business deal. It’s a kind of collaboration; remember that from the yarn company’s point of view, you are providing pattern support. Meaning: your design is a solution to the problem of, what can I make with this yarn? That means that you, as the designer, have a responsibility to provide a sensible answer to that question. 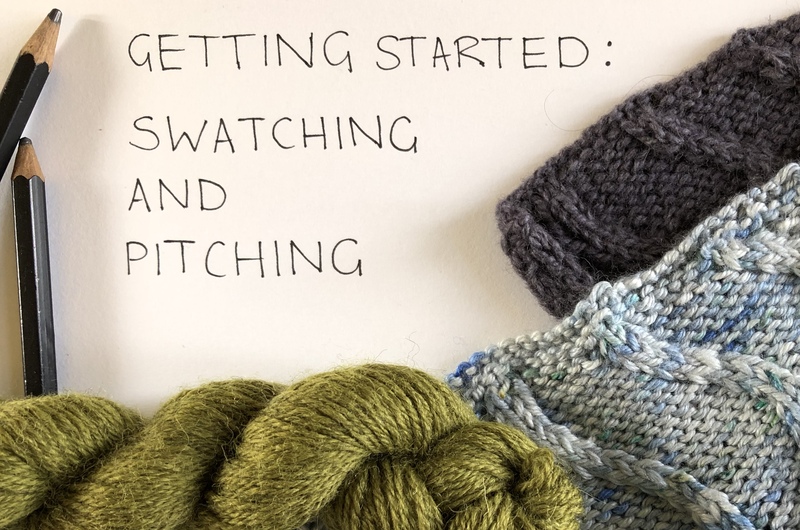 Don’t come up with a colourful design that calls for a small amount of each of six different skeins (unless you’re pitching it as a kit, and the yarnie is ready to provide smaller skeins for this purpose). Don’t ask for a luxurious, $40-per-skein hand-dyed cashmere for a densely cabled tunic. Sure, it may be gorgeous, but how many people are going to buy the recommended yarn? Is that fair to the dyer? Taking yarn support comes with a big responsibility. You need to deliver what you’ve pitched, on time (chances are you’ve set your own deadline, but do consider your yarn supplier’s seasonal marketing plan, especially if the launch is tied to a big yarn show or other event); you need to keep your supplier informed of your progress; you need to deliver a pattern, and photos, that will represent both of you well; and you need to carry your weight on the promotional side. Cross-promotion is actually one of the best reasons to work with a yarnie – considering what you’re taking on with such a partnership, sometimes it’s better to just pay for your own yarn, but getting a boost from someone with a bigger social media audience than your own can be really helpful. But remember you need to do your part too. Even if you can’t deliver the same number of views, you need to put the effort in to market the design, and talk about why the yarn you received is exactly what the customer wants to use. Sketch your design, swatch it and create a proposal for yarn support. There is a wonderfully comprehensive list of resources linked to in the Budding Designers group on Ravelry – browse and read! The Designers group also has a page of links to older discussions. This process is different for me (Emily) every time. Sometimes I have the yarn, and start with a small swatch to get an idea of how it works best. More often though, I have a pretty clear idea of what I want to achieve and will go and look for the yarn that will work best for the design. 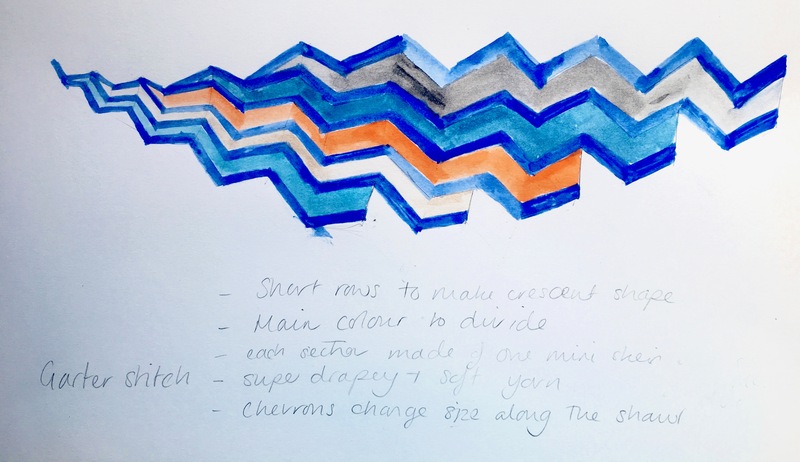 Remember that no-one is particularly interested in how good you are at sketching (and I am certainly no master) but you do need to record key design features and give an impression of how the finished garment will fit on the body. Even if you don’t need yarn support and so are sketching only for yourself, this step is key; you need to put some effort in to develop and record your ideas carefully. If I am going to be submitting this somewhere, I will usually spend a little more time getting it to look nice, but as I am usually only doing sketches for my own benefit I don’t worry about my drawing skills that much. Bristol Ivy’s Knitting Outside the Box. I love the design exercises in this book – so good for actually coming up with ideas, and thoroughly enjoyed the workshop with Bristol on the topic. Knitsonik’s books provide a wonderful, structured system for developing stranded colourwork ideas. Croquis from My Body Model. I have a croquis that is generated based on my body measurements, and use this as a base for all my garment sketches. This website also provides free croquis based on real bodies of all shapes and sizes. If you want a more typical, exaggerated fashion shape, there are lots free to download (just search for “croquis”). The other option is tracing over a photo from a magazine or any other source. Let’s be clear here, if you don’t like swatching, then you’re not going to like designing overly! I often work 4 or 5 swatches for a project, because I have learnt that it is better to figure out all those little details in advance of knitting the sample. – initial swatches to try out any stitch patterns and experiment with transitions between them. These don’t tend to be big, and I often rip them out if they aren’t working. If I have a yarn similar to what I intend to use for the final project then I will also try to work out what needle size to use. At this stage it is really important to keep detailed notes and sketch out charts of any lace pattern that you are using! You can never ever take enough notes. An example from Hunter Hammerson about how many swatches she makes for a hat. This series of swatches I made for the design I am currently working on. Any number of stitch dictionaries; there are many, both online and in print, to use as a basis for using and combining stitch patterns. By this stage you should have a good idea of what you are going to knit and how big it is going to be. Next you need to work out how much yarn you are going to use for the final design so that you can put in a proposal for yarn support. At this stage I would add on an extra 20% allowance. Bring all this together into one document, preferably on one page of a pdf. Be sure to include your contact details (email and postal address at a minimum) on each page. Use a good, well-lit photo of the swatch, the sketch of your design and a few notes on construction details, as well as the sizes that will be offered. Also make sure to include details on the final choice of yarn – the base, the colours and the number of skeins for each size. A guide to creating a submission (aimed at submitting to a magazine, but the basis is useful here). A thread with lots of examples, and this editor’s perspective from Alex Tinsley – covers magazine as well as yarn support pitches, and includes the tricky cover email.